In deception detection, unless someone says they did not do the specific thing they’re being accused of, it’s not a true denial. Sometimes it only sounds like a denial. They may deny the conclusion (I’m not guilty), but they won’t deny the act (I didn’t delete the files). A truthful person will answer specific questions with direct responses, whereas a deceptive person avoids answering the question. 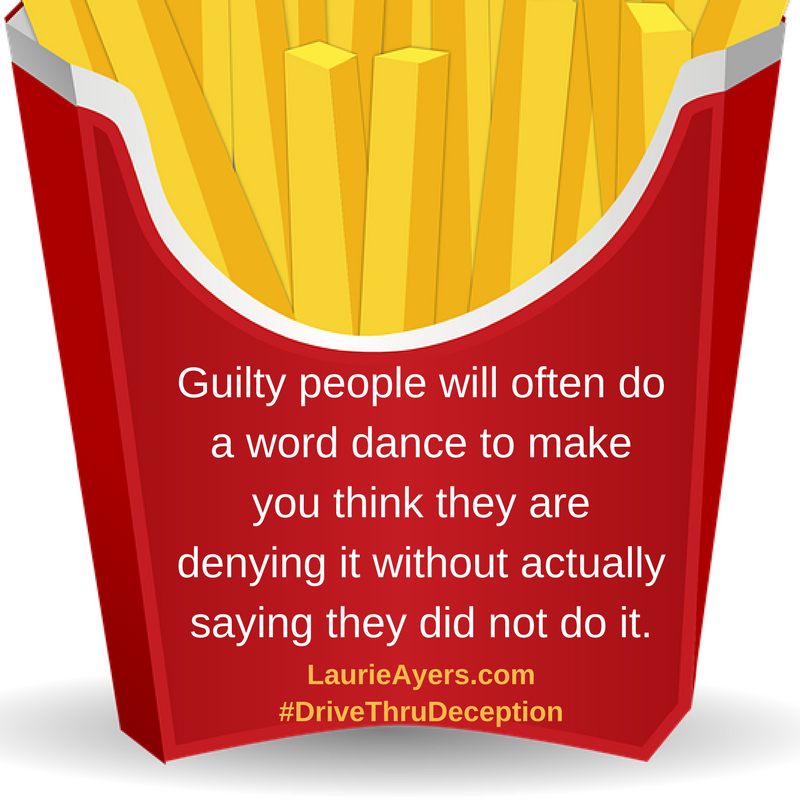 Because people don’t want to outwardly lie, guilty people will often do a word dance to make you think they are denying it without actually saying they did not do it. They want you to believe it is impossible for them to have done what you’re suggesting. They want you to conclude they haven’t done it. When these phrases are used, you cannot believe they did not do it, because they have not told you they have not done it. In 2008, Casey Anthony was charged with the murder of her daughter. She was found not guilty in 2011. Here is an excerpt from a March 7, 2017 interview she gave to the Associated Press, underlines added to highlight this point. When people give a denial, look to see if they denied specifically what they are accused of or if they merely denied the conclusion that others believe they are guilty. 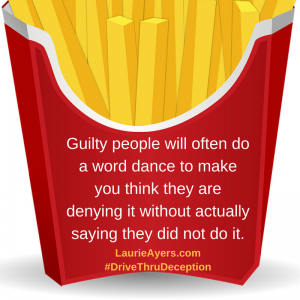 As Managing Director of Concealed Statements, and author of Drive Thru Deception, I work with men and women who want to increase their deception awareness to avoid wasting time or money and avoid making poor decisions based on inaccurate information.